The set from Practical Magic, my all-time favorite movie set/dream house. Courtesy of Hooked on Houses. I constantly reimagine my high school life through movies. Not only because I was quite awkward during those years, but also because I attended a moderately dumpy high school that was outdoors, and my memories of freezing before classrooms opened in the mornings still haunt me to this day. So I relish every classic high school setting, and consistently yell at spoiled on-screen high-schoolers for not constantly appreciating how lovely it is to wait for class to begin INDOORS. End rant. This seriously beats out every English boarding school movie I have ever obsessed over. When you think of the ultimate movie High School setting, what would be the first one that pops into your mind? No, not The Breakfast Club. Not Mean Girls. Dammit, this is not going well, and I'm just arguing with myself. Spoiler alert: it's in the title of this post. Castle turrets! 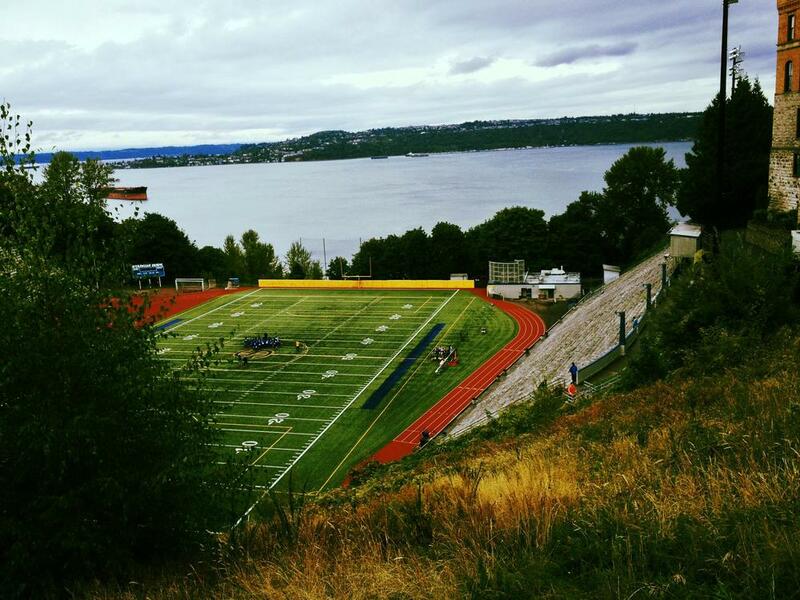 A stadium overlooking the water! The late Heath Ledger and young Joseph Gordon-Levitt! On one of my first dates with the LOML, I revealed that I loved the "10 Things I Hate About You" high school more than any other movie high school, and instead of treating me like a crazy person, LOML told me that he knew where it was, had been there, and would take me there soon. The "there" happened to be Stadium High School in Tacoma WA, and the "soon" happened to be almost 6 years later, but I don't care, because I went, and it was spectacular. I was thrilled that it was an appropriately gloomy Pacific Northwest day. No really, I was, I wanted the authentic experience. 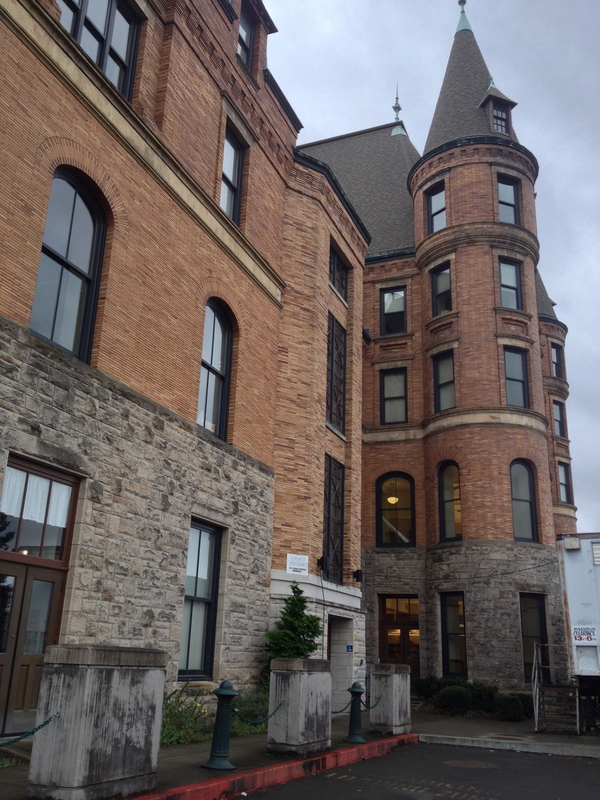 Sorry I couldn't get photos of the inside area, but photos online reveal it to be quite lovely for a high school, but with the exception of an incredible view and some awesome turret rooms, also rather ordinary. Did I just contradict myself? Anyways, let's just say the carpet didn't match the drapes. Wait, that's not right. It doesn't look like a castle inside. If you wanted it to look like a castle, you would be sorely disappointed. No castle here, no sirree. I would highly advise searching google images for some professional images (the ones at night are especially beautiful) because these, obviously, are not, and if you are ever in the Seattle area, it is definitely worth a 30 minute road trip to see. Here's hoping they have a teaching position opening up soon for the only subject I would be qualified to teach: Fictitious creatures & whimsy. I should probably go prep my syllabus now: Week 1: Unicorns and their overhyped healing abilities. I really hope the students call this Hagrid's hut. "Hey, wanna meet up at Hagrid's before the game?" they might say. YES. Yes I do.